Robinsons – A professional team of dedicated, experienced heating engineers who are fully trained on all makes of Oil, Gas and LPG boilers. As a family business, we maintain those core family values throughout our business. So with extensive knowledge and an enviable standard of workmanship, this gives you what you need. A professional, home heating service that is honest and reliable. Your calls are always answered, your messages always returned. Our office manager is a qualified engineer; this knowledge proves invaluable to our customers, especially in the winter when demand is high. OFTEC registered for Oil, Gas safe registered for Gas & LPG. 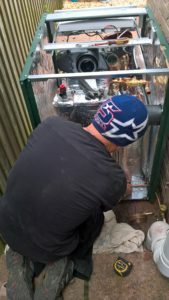 We are known for and focus on the repair, service and installation of oil fired boilers and heating systems; With a comprehensive breakdown service which allows us to get to you within 24 hours of your call and with 99% of oil and heating spares kept on our vans, it means that we will usually get you up and running in one visit. In addition to our Oil services, we offer gas & LPG boiler replacements and service most makes of modern gas & LPG boilers. We are proud to be Worcester-Bosch Accredited installers, breakdown engineers for Firebird and Warmflow Boilers, service engineers for Boilerjuice and service & breakdown engineers for Blufin Boiler plus Insurance. All work is fully insured and guaranteed, giving you, the customer, the peace of mind needed when choosing a reputable company to undertake any work. Located between Grantham, Sleaford, Spalding & Boston, we are in an ideal position to reach any point in our coverage area easily. Peterborough, Oakham, Uppingham, Bourne, Stamford, Spalding, Holbeach, Wisbeach, Boston, Grantham, Bingham, Nottingham, Tuxford, Newark, Lincoln, Market Rasen, Horncastle, Spilsby, Woodhall Spa, Alford, Louth and all the villages in between! !